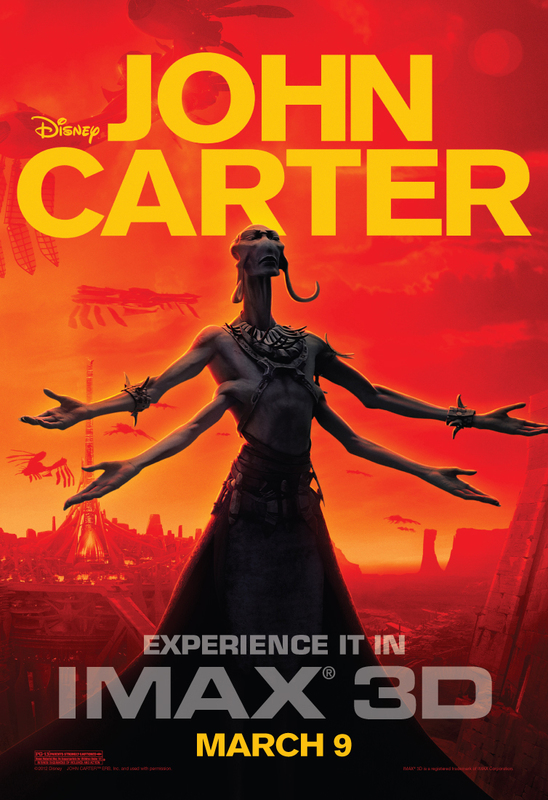 Fandango released an IMAX 3D poster from the upcoming Walt Disney Picturesâ€™ â€œJohn Carterâ€ movie. The film stars Taylor Kitsch, Lynn Collins, Samantha Morton, Mark Strong, Ciaran Hinds, Dominic West, James Purefoy, Daryl Sabara, Polly Walker, Bryan Cranston, Thomas Hayden Church and Willem Dafoe. The film is based on the story â€œA Princess of Marsâ€ by Edgar Rice Burroughs. The film tells the story of war-weary, former military captain John Carter (Taylor Kitsch), who is inexplicably transported to Mars where he becomes reluctantly embroiled in a conflict of epic proportions amongst the inhabitants of the planet,including Tars Tarkas (Willem Dafoe) and the captivating Princess Dejah Thoris (Lynn Collins). In a world on the brink of collapse, Carter rediscovers his humanity when he realizes that the survival of Barsoom and its people rests in his hands. The film is directed by Andrew Stanton (â€œWall-E,â€ â€œFinding Nemoâ€). Walt Disney Pictures will release the film in theaters on March 9th.